First off, a memetracker is a site that tracks breaking news in the blogosphere. That said, with Tailrank 2.0 being released today, I thought it might be interesting (as did others) to compare it with current leader Techmeme. While I like the color scheme of Tailrank, it doesn't scan as well as Techmeme. There are maybe 10 or 12 stories listed right now on the Technology page compared to maybe 30 to 40 on Techmeme. Right there, that's a disadvantage since I have to spend time clicking through to get a deeper pass through the latest news. Depth is also important. Right now, Tailrank indexes 110K blogs, but is planning to expand to 250K soon. Techmeme only a few thousand. So, Tailrank does live up to its name by keeping an eye on the long tail of blogs. It also allows searches unlike Techmeme. There are also areas of overlap. 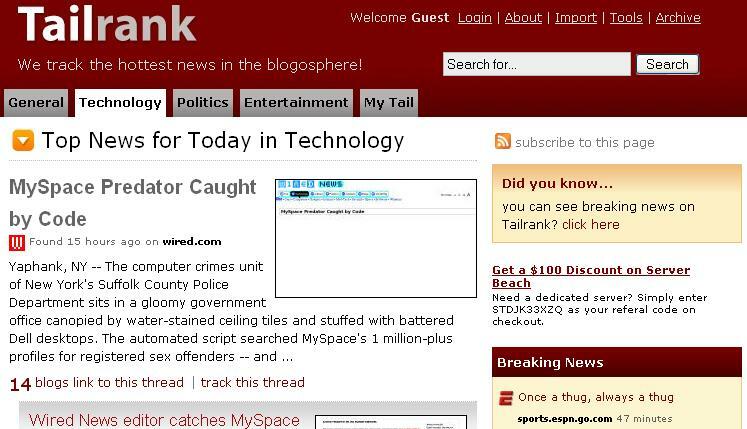 Top stories right now are MySpace predators, Edelman and Wal-Mart, and the New York Times on social networking sites. 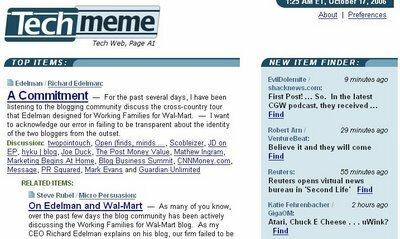 Overall, Techmeme is like subscribing to an RSS feed that only covers stories from a select few sites while Tailrank has the potential to link to stories that aren't dominated by the major blogs. I'm sticking to Techmeme for its one pass display of the latest news, but I'm guessing that Tailrank will race ahead in features and comprehensiveness if it hasn't already.